Heavy rain resulted in a really thrilling race with numerous position changes in the seventh DTM season round at Brands Hatch in the UK. With his 2008-spec Audi A4 DTM, Martin Tomczyk became the dominant race winner and also toppled Canadian Bruno Spengler (Mercedes-Benz) from the lead in the drivers’ standings. “This was an incredibly exciting race. I really enjoyed the ride. We keep on pushing and will thus make the battle for the title exciting”, said Tomczyk, who was presented with the winner’s trophy by ex Formula 1 world champion Jody Scheckter. For the 29-year old German, it was his seventh DTM season win and already his third of this year. Tomczyk’s fellow Audi drivers Mattias Ekström from Sweden and Italian Edoardo Mortara completed the clean sweep of the podium for Audi at the circuit near London. Ekström made a brilliant start to move up from fifth to second right away. Mortara already scored his maiden podium finish in only his seventh DTM round. During the race, Ralf Schumacher (Mercedes-Benz) was able to make up two positions and crossed the finish line in fifth place. Mike Rockenfeller, however, was having problems. The Audi driver started from pole position, but had to allow five drivers in front of him and eventually still scored three points for the drivers’ standings by finishing sixth. Bruno Spengler came to Brands Hatch as the leader in the points’ standings, ended up sixth in qualifying and was docked another two positions on the starting grid due to an infringement of the regulations in second free practice. In the race, the 28-year old only made up one place. In seventh place, Spengler scored two points and thus lost the championship lead to Tomczyk, who is now one point clear. Timo Scheider (Audi) already damaged his car at the beginning of the race and wasn’t able to make up for time lost following an additional pit stop. He ended up 16th. In total, 21,000 spectators watched the race in Great Britain. 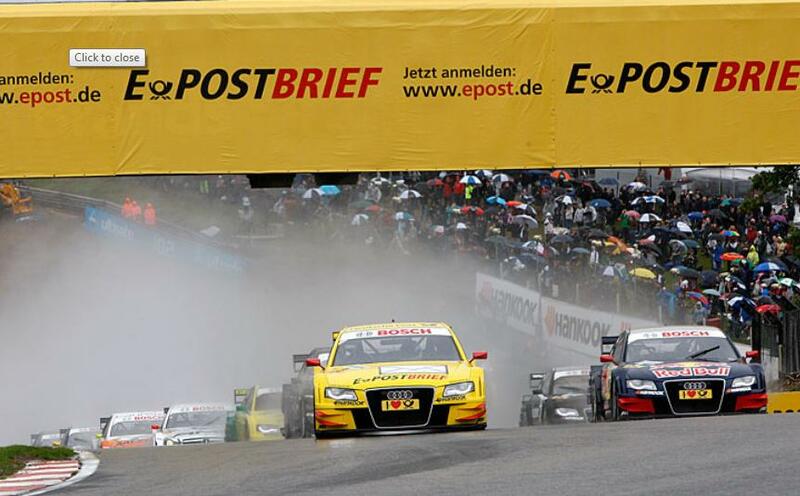 The eighth DTM race weekend of the season will take place at Oschersleben from September 16th till 18th.